Picnics are great, aren’t they? The scrumptious food, stunning natural surrounds, and warmth of sunshine. One thing that can certainly turn a picnic from ordinary to outstanding is the blanket on which you’re sitting – after all, you want to be comfortable and have somewhere stylish to lay out your food! You’ll find it all here. It’s time to gather your friends, food, and favorite DIY blanket – Let’s picnic! This monochrome DIY picnic blanket from A Beautiful Mess is just what you need for those long, lazy days spent reading in the sun. Mix and match your favorite patterns for a unique look! This colorful and fun pineapple print is just the thing to jazz-up a plain picnic blanket. Check out the full tutorial from A Bubbly Life! Got plenty of old sweaters just lying around? Don’t know what to do with them? You’re in luck, because Alisa Burke will show you how to create this DIY patchwork sweater picnic blanket! Did you know that this DIY picnic rug tutorial uses a potato? It might sound strange, but you’ll have to check out the full set of instructions from Almost Makes Perfect to find out why! We can hardly believe that this DIY picnic blanket from Andrea’s Notebook has been made using her old denim jeans! If you want to re-create your own, be sure to check out her tutorial. If there’s one thing we can probably all agree on, it’s that pom poms make everything better! A Pair and a Spare has added these pom pom tassels to her own picnic blanket for a makeover worthy of its own tutorial. Two of our favorite combinations are pink and watercolor, so you can imagine our excitement at discovering this pretty-as-a-picture DIY picnic blanket from A Subtle Revelry! This beautiful blue and purple DIY ombre picnic rug is also perfect for laying on at the beach – isn’t that great? Billabong will show you how to make your own. Brit + Co will teach you how to make not one, or two, but three stunning painted picnic rugs! Which fruity design will you make? Personally, we can’t choose! Learn how to create your very own patchwork roll-up picnic blanket thanks to this DIY tutorial from Centsational Girl. Which pretty patterns will you incorporate into your design? Fancy creating your own water-resistant and reversible picnic blanket? It’s actually easier than you think! Clarks Condensed will show you how! This DIY picnic rug from Crazy Little Projects is gorgeous, isn’t it? You can actually create it in just one afternoon, so be sure to check out this tutorial! 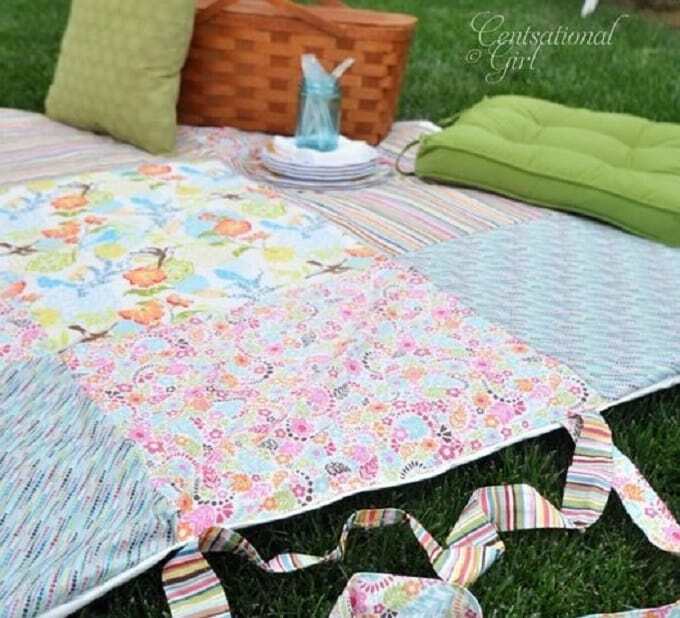 eHow has a step-by-step guide to help you re-create this hardy and eye-catching picnic blanket design. What fabric will you make yours with? In a rush to create a picnic blanket? Thankfully, Flamingo Toes has shared her tutorial teaching us all how to make one in just 15 minutes…Amazing! Flights of Delight has created her own DIY waterproof picnic rug – Genius! Want to make your own too? Check out her full tutorial for instructions. We had no idea that making your own picnic blanket could be as easy as this! Greatest will show you how with this simple DIY tutorial. Want somewhere dry and hardy to sit on for your next picnic? Make an easy water-resistant up-cycled jeans picnic blanket from your old jeans, thanks to this instructional guide from a Houseful of Handmade. IKEA bags are just one of those things that we all seem to have lying around at home. Do you need them all? Certainly not! That’s why you should check out this tutorial from IKEA to see how you can make a picnic blanket from them! Did you know that you can punch grommets in the corner of a blanket and use golf tees to keep it in the ground? Infarrantly Creative will show you how! Wow, this round picnic blanket from Little Bit of Thyme looks amazing! Fancy making one for yourself? You’ll find everything you need to know in the tutorial. There’s a reason why this DIY picnic blanket from Lovely Indeed has gone viral – it’s stunning! We love the ‘let’s picnic!’ embroidery. This geometric picnic blanket from Modern Handcraft will certainly turn heads! It looks so good that passers-by won’t even believe that you made it yourself. Here’s a great use for bandannas – create a fancy picnic blanket from them, just as One Good Thing by Jillee has done! The best thing about this DIY project is that you can use a variety of colors, prints, and patterns. Craving a totally groovy picnic blanket? Making your own has never been easier thanks to this DIY tutorial from Pop Cosmo! We love this DIY indigo dyed picnic blanket from Say Yes and have a feeling that you’ll adore it too! Be sure to take a peek at the full tutorial. Here’s a simple little craft tutorial from Sew DIY to teach you how to create this classic and functional picnic blanket. Create one for yourself, or even a loved one! Learn how to crochet your own picnic blanket by following this step-by-step guide by Sewrella. You’re going to absolutely love this DIY project! How fun is this DIY pom pom picnic blanket from the talented Studio DIY? Something this colorful will certainly make you want to have a picnic every weekend! Wear your pride on your picnic blanket with this DIY American flag blanket from The House that Lars Built. Not a bad idea at all! This DIY bicycle print picnic blanket from Tried and True is such a clever idea! You can also use this method to create a different print of your choice. There you have it – 30 amazing DIY picnic blankets that you can easily create yourself. Which ones were your favorites? We’d love to hear from you in the comments section below!